If you are looking to remove tooth staining caused by red wine, tea, coffee, curries or smoking then our AirFlow treatment could be just the ticket. Although this treatment is not a tooth whitening therapy, the AirFlow will significantly improve tooth brightness and give you a noticeably sparkling fresh healthy mouth in an instant. For great results we usually book this as an extra boost to your smile after a hygiene visit. 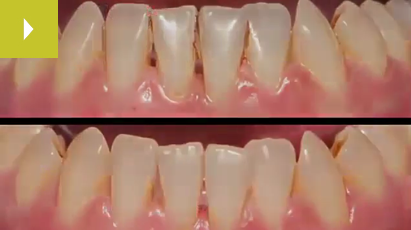 Your teeth will feel fantastically smooth and fresh after AirFlow polishing. AirFlow polishing is a hygiene cleaning treatment that uses a mixture of air, jet water and fine powder to gently and effectively blast away stubborn stains and any plaque on your teeth, returning them to their natural whiteness. This treatment does not include chemicals and poses no risk to patients. AirFlow is an advanced polishing treatment that allows you to walk away the same day with amazingly clean results. AirFlow gets into the nooks and crannies of your teeth, giving you a really effective and overall hygiene clean, leaving you with healthier teeth and gums and a naturally brighter smile. Do I have to book a special appointment for AirFlow? AirFlow is ideal as an add-on after your usual hygiene appointment for busy people, especially for professionals who engage clients every day and want to look their best. Will it whiten my teeth? Your teeth will certainly look whiter and brighter as AirFlow returns them to their natural whiteness. However, tooth whitening is still the best solution for improving the whiteness of your smile by any more than two shades. AirFlow is perfect after a hygiene session and before whitening to ensure you get the best results from your whitening treatment. I didn't want to change my identity, just wanted to look less tired and I feel the wrinkle reduction injections helped me to do this. I wanted something enhanced my natural beauty and natural to me means that it is a better version of me, but still is me. I did this for me. It only matters that I see the difference. I've received so many compliments since my treatment, but what people say: you look good. You look happy. The team at Smile Essential have given me confidence which I never experienced from a dentist before. I cannot thank you enough for the treatment you have done for me. I would highly recommend you to everyone. Lina, you have completely restored my faith in dentists; my new smile is so much better and I have really appreciated your sympathetic and caring approach - thank you! Thank you so much for helping me get my smile back! It has made a tremendous difference to my self confidence. You have completely restored my faith in dentists; my new smile is so much better and I have really appreciated your sympathetic approach. Thank you!! Thank you for the good work on my new 'cap' this year. I am very pleased with the fit and colour of my new tooth. It looks much better now. Thank you for your kindness during my treatment and restoring my faith in dentists. Many thanks for reassuring me and your gentle caring approach. Thank you so much for helping me to get my smile back! It was well worth the long stints in the chair even if I was the biggest coward! –thanks for your patience. Thank you for giving me my smile back. I can’t stop smiling now and my only regret is that I should have come to see you years ago! The whole family have now been coming to the practice for over 5 years and the peace of mind together with the 1st class service you offer has been excellent. Thank you for your kindness and thoughtfulness which I appreciated so much. Bless you. Thank you so, so much for the dental treatment to make my front teeth look nicer. I feel much more confident in smiling with my new veneers. Thank you so much. Thank you for making me feel so relaxed when I came to see you for my fillings. Like many people the dentist is not my favourite place to visit but your calm manner put me totally at ease. I am very pleased with my new white fillings and look forward to my next appointment. Copyright © Smile Essential. All rights reserved.